In addition to a thorough history and physical examination, magnetic resonance imaging (MRI) of the brain is recommended. 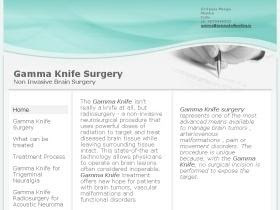 This procedure helps identify a brain tumor in the rare cases in which it is present along with Trigeminal Neuralgia . It may also help to diagnose multiple sclerosis. Often when the MRI is performed, some contrast material is injected into the vein so that the appearance of a small tumor, blood vessel, or other structures in the brain can be enhanced and made easier to detect. The disorder is characterised by episodes of intense facial pain that usually last from a few seconds to several minutes or hours. The episodes of intense pain may occur paroxysmally. To describe the pain sensation, patients may describe a trigger area on the face, so sensitive that touching or even air currents can trigger an episode. It affects lifestyle as it can be triggered by common activities such as eating, talking, shaving and toothbrushing. The attacks are said by those affected to feel like stabbing electric shocks, burning, pressing, crushing, exploding or shooting pain that becomes intractable. Individual attacks usually affect one side of the face at a time, lasting from several seconds to a few minutes and repeat up to hundreds of times throughout the day. The pain also tends to occur in cycles with remissions lasting months or even years. 10-12% of cases are bilateral, or occurring on both sides. This normally indicates problems with both trigeminal nerves since one serves strictly the left side of the face and the other serves the right side. Pain attacks typically worsen in frequency or severity over time. Many patients develop the pain in one branch, then over years the pain will travel through the other nerve branches. Several theories exist to explain the possible causes of this pain syndrome. It was once believed that the nerve was compressed in the opening from the inside to the outside of the skull; but newer leading research indicates that it is an enlarged blood vessel - possibly the superior cerebellar artery - compressing or throbbing against the microvasculature of the trigeminal nerve near its connection with the pons. Such a compression can injure the nerve's protective myelin sheath and cause erratic and hyperactive functioning of the nerve. This can lead to pain attacks at the slightest stimulation of any area served by the nerve as well as hinder the nerve's ability to shut off the pain signals after the stimulation ends. This type of injury may rarely be caused by an aneurysm (an outpouching of a blood vessel ); by a tumor ; by an arachnoid cyst in the cerebellopontine angle ; or by a traumatic event such as a car accident or even a tounge piercing. A large amount of multiple sclerosis patients have TN, but not everyone with TN has MS. Only two to four percent of patients with TN, usually younger, have evidence of multiple sclerosis , which may damage either the trigeminal nerve or other related parts of the brain. It has been theorized that this is due to damage to the spinal trigeminal complex . 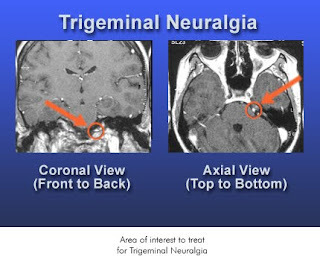 Trigeminal pain has a similar presentation in patients with and without MS.
Post herpetic Neuralgia , which occurs after shingles , may cause similar symptoms if the trigeminal nerve is damaged. When there is no structural cause, the syndrome is called Idiopathic . Trigeminal neuralgia (TN), tic douloureux (also known as prosopalgia) is a neuropathic disorder of one or both of the trigeminal nerves . Its nickname is "the suicide disease" because of severe associated pain , and the fact that it is not easily controlled or cured. It causes episodes of intense pain in any or all of the following: the ear, eye, lips, nose, scalp, forehead, teeth or jaw on one side and alongside of the face. It is estimated that 1 in 15,000 people suffer from trigeminal neuralgia, although the actual figure may be significantly higher due to frequent misdiagnosis. TN usually develops after the age of 50, more commonly in females, although there have been cases with patients being as young as three years of age . TN brings about stabbing, mind-numbing, electric shock-like pain from just a finger's glance of the cheek or spontaneously without any stimulation by the patient. Cold wind, high pitched sounds, loud noise such as concerts or crowds, chewing, talking, can aggravate the condition, and for the worst cases, even smiling, a scarf, the wind or hair on the side of the face is too much to bear.